Sandra Clinger is the East Central Florida Regional Coordinator for Save the Manatee Club. We asked her several questions about where we are headed and how Save the Manatee Club positively contributes to Central Florida’s future. Where do you see Brevard in 5 or 10 years? Where are we headed? I have lived in Brevard most of my life and I love Brevard. Where else can you see a rocket launch sitting in a kayak surrounded by manatees! I think we are at a very critical time for the future of Brevard County, and what happened in the next 5 or 10 years will be pivotal in determining what that future will look like. I am becoming increasingly concerned at the rapid rate land is being developed, and the way it is being developed. Will we become another Broward County or will we adopt and enforce meaningful protective measures that preserve our quality of life? If we don’t change the course we have been on, we can be guaranteed increased traffic congestion, over-crowded schools, depleted supply of drinking water from the aquifer, decreased wildlife habitat quality and quantity resulting in reduced species diversity and abundance, and increased pressure and impacts on public lands, just to name a few. I think everyone can agree that none of those things increase our quality of life. What is the most troubling thing you see? Rampant growth. The number of people moving to Brevard and the surrounding areas just cannot be sustained. Overnight diverse habitat is cleared to the bare ground, and its habitat value to all but people is eliminated. All too frequently the discussion at the government level only focuses on the increase in tax base growth brings without ever fully considering the true cost of increased development. One obvious example is water – we just don’t’ have the drinking water to keep growing. The St. Johns River Water Management District is already showing deficits in central Florida based on current known demands for water. Alternatives exist, but they are still fraught with problems and take time and money to develop. While upland species may feel the first impacts of growth and development, aquatic species are impacted as well. For manatees, growth pressure is directly impacting manatee survival through increased boating and development activity in manatee habitat. More people moving to central Florida means more coastal development impacting manatee habitat and forage and boats on the water increasing the risk of collision resulting in the injury or death of the manatee. 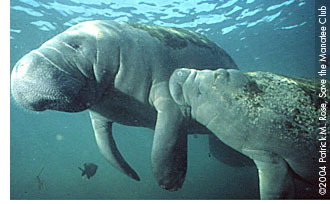 Increasing demand for potable water is an equally serious threat to the manatee’s long-term survival. Blue Spring, a first order magnitude spring and one of a few natural warm water winter refuges for manatees, has already been reduced due to groundwater withdrawals to supply an increasing population. Less spring flow means less warm water for manatees during the winter months. The reduction in groundwater is similarly affecting other springs, lakes, and wetlands all over Florida. How can we face and fix these problems? We need our elected officials to focus on growth based on sustainability and preservation of our quality of life. For this to happen, more citizens have to get involved and actively participate. People have to stop complaining to friends and neighbors and start complaining to elected officials. Without an upwelling of public outcry, we will continue destroying the very essence of what makes Brevard such a great place to live and raise a family. More citizens have to take an active role in determining the future of Brevard by becoming watchdogs and taking an active role in ensuring that the rules and regulation necessary to protect our quality of life are in place, enforced and effective. What is Save the Manatee doing? The Save the Manatee Club (SMC) mission is to ensure better protection for manatees and their habitat through public education projects; manatee research; rescue and rehabilitation efforts; advocacy and legal action. We advocate for manatees and watchdog the rules and regulations that protect manatees and their habitat – including Comprehensive Plans, local ordinances, state statutes and rules, and federal regulations. We comment on permits at the state and federal level the may impact manatee habitat. So, while SMC is focused on protecting manatees and manatee habitat, the protections we are able to secure for manatees also help a wide variety of other species sharing their habitat. In Brevard County two important milestones were recently achieved – the Brevard County Manatee Protection Plan (MPP) was approved and we were able to secure more comprehensive countywide speed zones, including a new federal manatee refuge. It took more than 10 years, but a good MPP was finally adopted for Brevard! The MPP puts in place a comprehensive manatee protection strategy focused on education, boat facility siting, habitat protection, law enforcement, and other manatee protection initiatives. As an example of the accessory benefits from manatee protection efforts, the MPP strictly limits boat facility development in seagrass beds to prevent additional seagrass damage from shading and propeller scarring. Healthy seagrass beds are good for fish populations, and healthy fish populations are good for dolphins and fishermen! Currently SMC is fighting against amendments that are proposed that will weaken the Florida Administrative Code (Chapter 18-21, and Chapter 18-20) dealing with how the state manages and issues permits in sovereignty submerged lands and aquatic preserves. Development pressure to open up leased public submerged lands to vastly more intensive use is what is driving the proposed amendments. Since these submerged lands are supposed to be managed and held in trust by the state for all the people of Florida, everyone has a vested interest in how these lands are being managed and protected – or not protected. The state of Florida has a statutory responsibility to manage and protect submerged lands and ensure that authorized activities are in the public’s interest and do not damage those resources or adversely impact threatened or endangered species. For these amendments to be stopped they must hear from lots of citizens who want their land responsibly managed. Those who want to find out more about this and other important issues to Save the Manatee Club’s web page and see the Take Action section. I love manatees and other wildlife. As long as I can remember I have always been fascinated by animals and wanted to know more about them, so much so that I got my graduate degree so that I could devote my time working on conservation issues. If you could change one aspect of Brevard, what would it be? I would love to see more average citizens getting involved and speaking out. Too frequently it is the same few faces willing to speak out at county/city commission, public hearing and workshops to get on the record. Brevard residents obviously support protection of our natural areas, as evidenced by the recent re-authorization of the Environmentally Endangered lands bonds by an overwhelming majority. What prevents Brevard from being all it could be? In action, and people thinking someone else will take care of it. Each of us has a responsibility to help craft the future of Brevard County. Our future quality of life is largely going to be determined by the decisions made today. If you haven’t actively participated and voiced your concerns, someone else will have shaped that future – and you might not like what you get. What makes Brevard so unique? I think it’s the incredibly diverse natural environment with the Space program as a back drop. Its places like the Enchanted Forest, where I used to swing across the Addison Canal on a rope as a kid, and knowing public action ensured its protection so my kids can enjoy it too. It’s the Sebastian River, so beautiful and diverse that when hosting a group from Washington DC, they accused me of staging the bald eagle diving in front of the boat catching a fish. It’s the little things that we get to enjoy every day that we may take for granted until someone comes to visit from out of town and reminds us of just how magical this place we call home really is. But we can lose it and have it become just like so many other places in Florida that people can’t move away from fast enough. It’s up to us — all of us — to take the time, get active, get involved, and speak out. Your help and support is greatly needed. 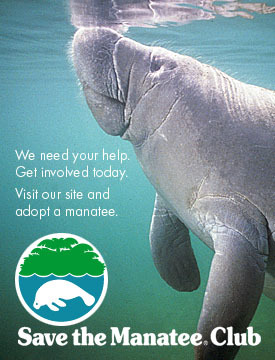 Consider joining the Adopt-A-Manatee program by visiting the Save the Manatee Club. Another way to get involved is by signing up for the Club’s E-Mail Action Alert Team. You’ll be joining thousands of others who receive information on current manatee issues and how you can help. Just send your e-mail address to action@savethemanatee.org ask to be added to the list.